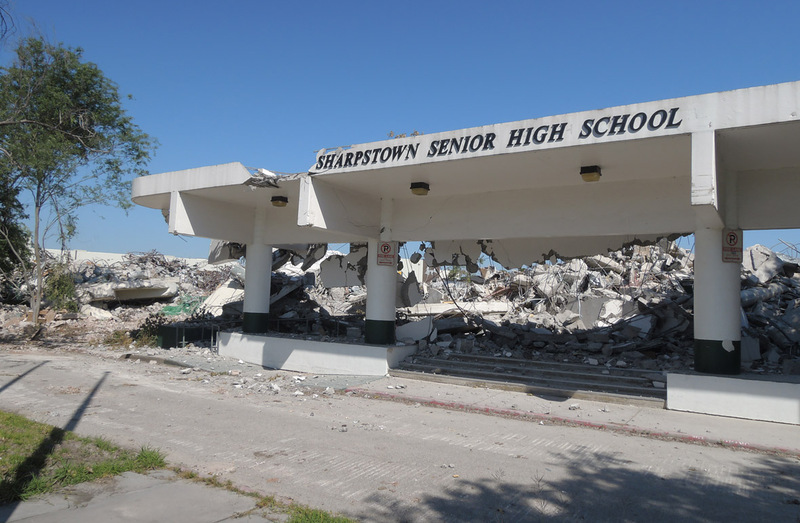 I'm a 1985 graduate of Sharpstown High School. 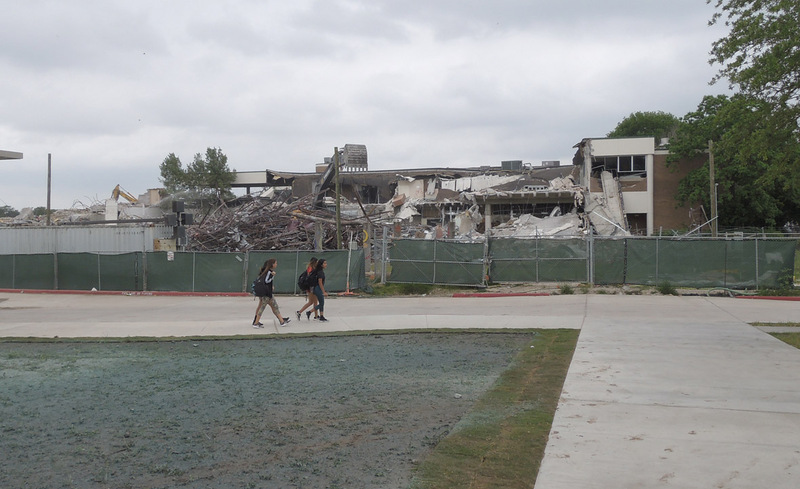 I can't say I have fond memories of high school (I wasn't in the social elite), but I am intrigued by the short life of many buildings in Houston, so I took many photos of the demolition. 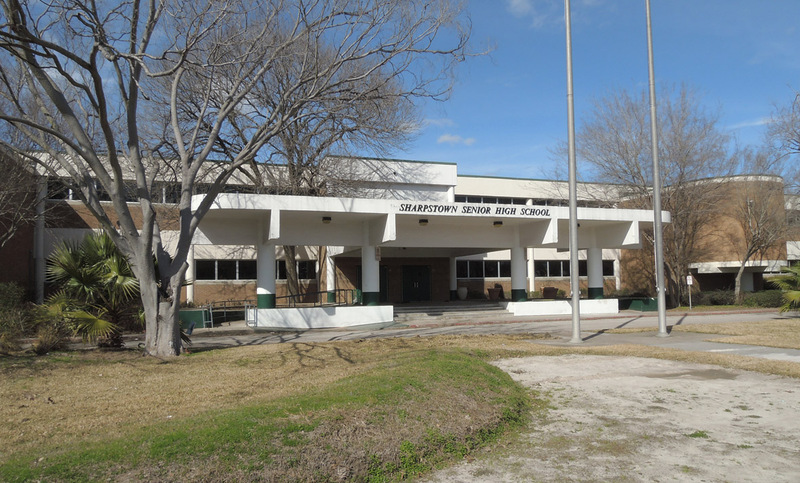 The original Sharpstown High School opened in September 1969 with its first graduating class in 1970. 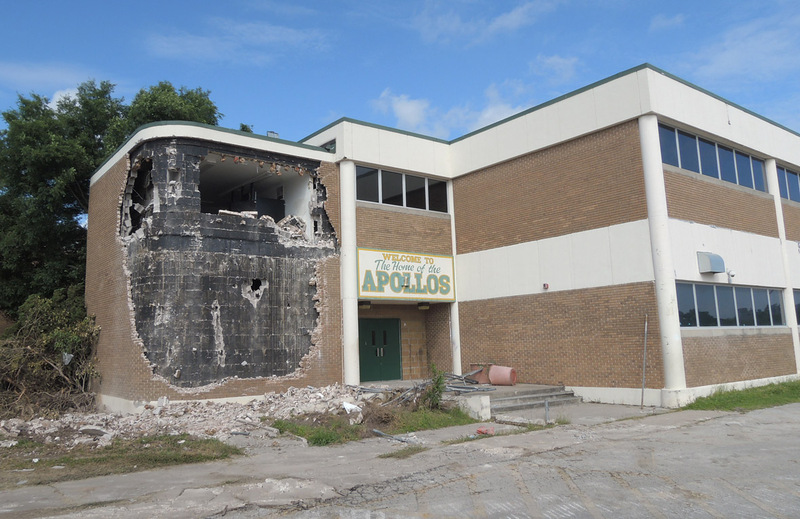 Of course, the first Apollo moon landing took place in July 1969, and that was the inspiration for the school theme/mascot. 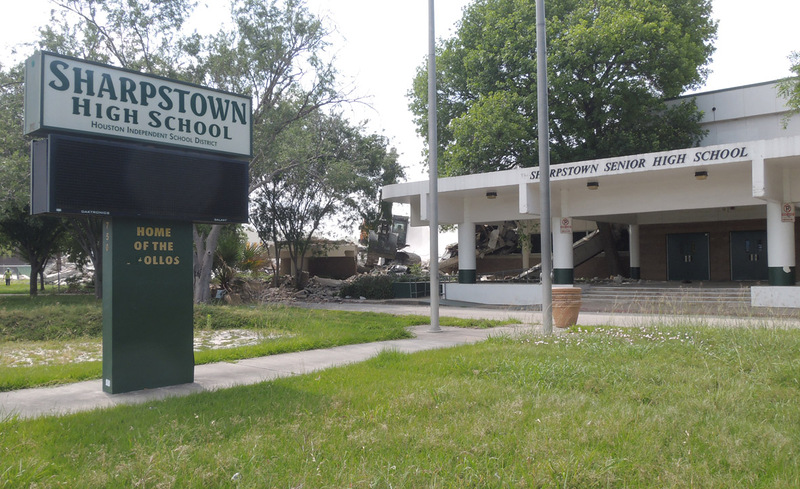 The original school building reached the age of 49 before it succumbed to demolition. 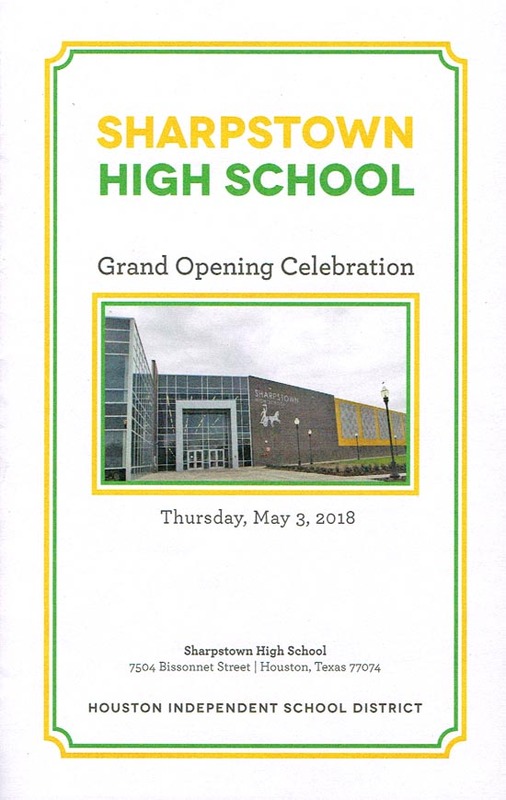 The replacement school opened in early 2018, and has a much nicer main hall/mall, and of course is designed to modern standards. 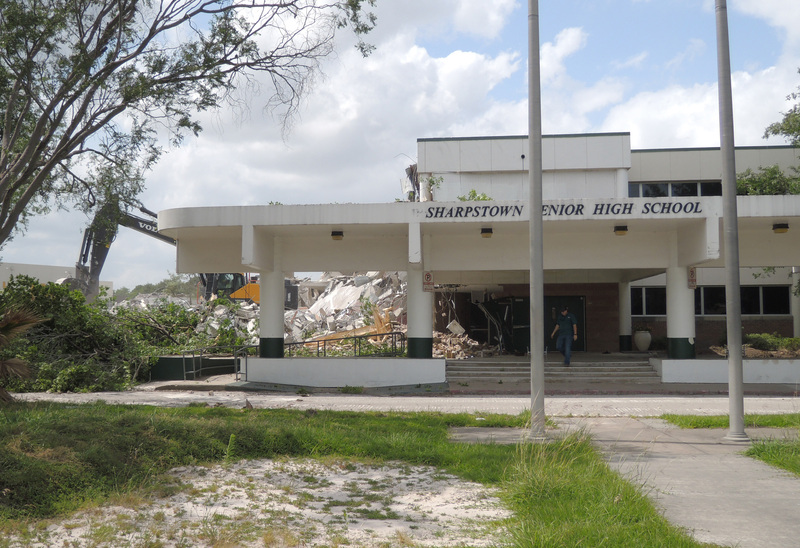 So if you are a graduate of Sharpstown High School, here's a photo collection of the demise of the building. 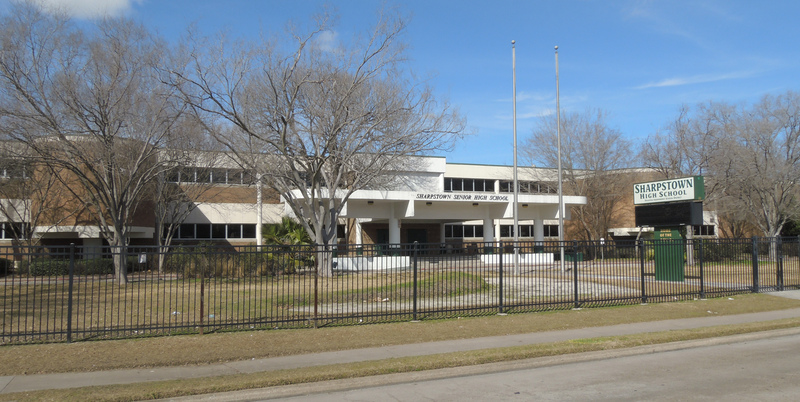 High Resolution (31-Jan-2018) January 2018 photo prior to demolition. (31-Jan-2018) Pre-demolition photo showing the west side of the building. In the early 1980s, the smoking area was along the windowless wall in the background. 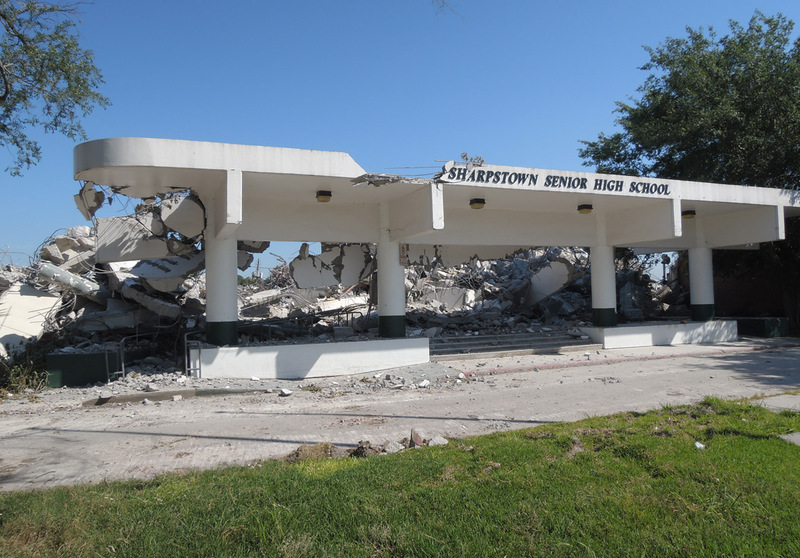 (30-April-2018) By late April, demolition was well underway. 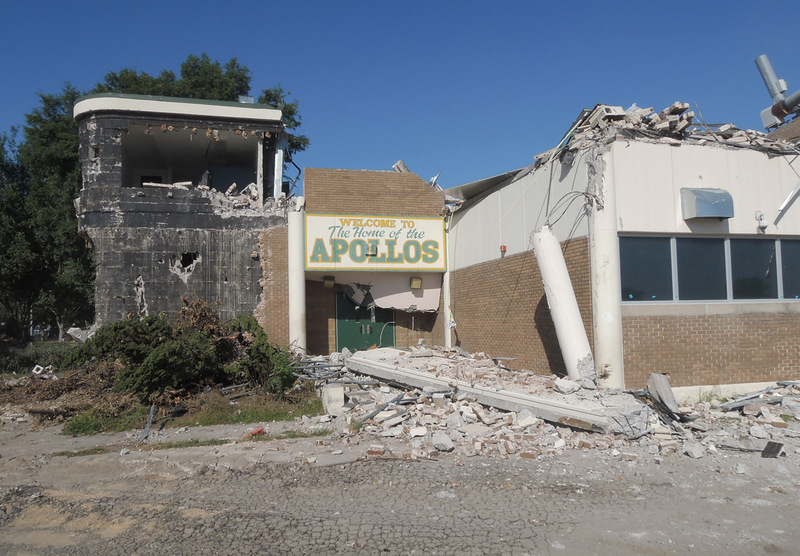 The east entrance featured the text "Welcome to The Home of the Apollos"
(30-April-2018) The north half of the building was mostly demolished and cleared at the time of this photo. 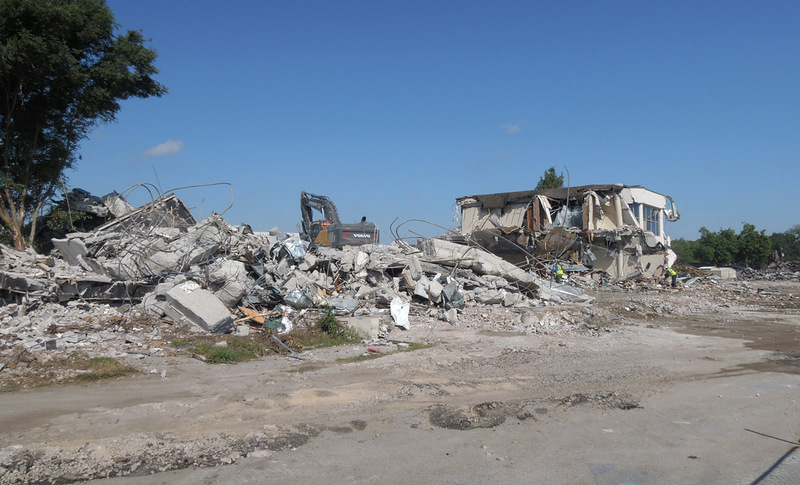 High Resolution (30-April-2018) The south half of the building, which included the main front entrance and most classrooms, remained intact. 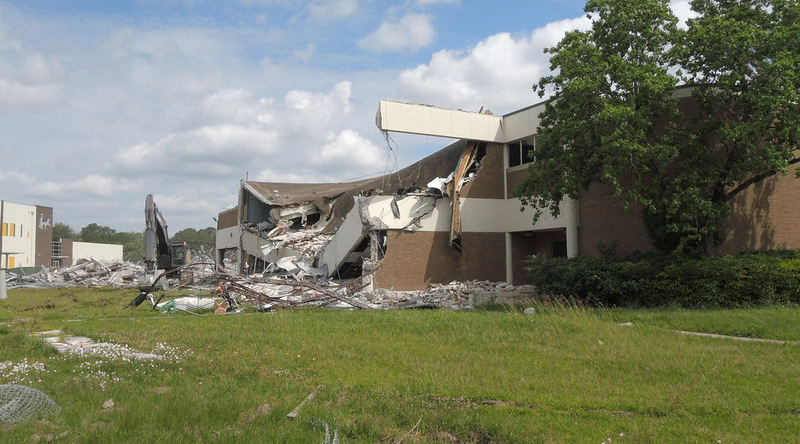 (30-April-2018) Demolition of the south half of the bulding started on the west side. 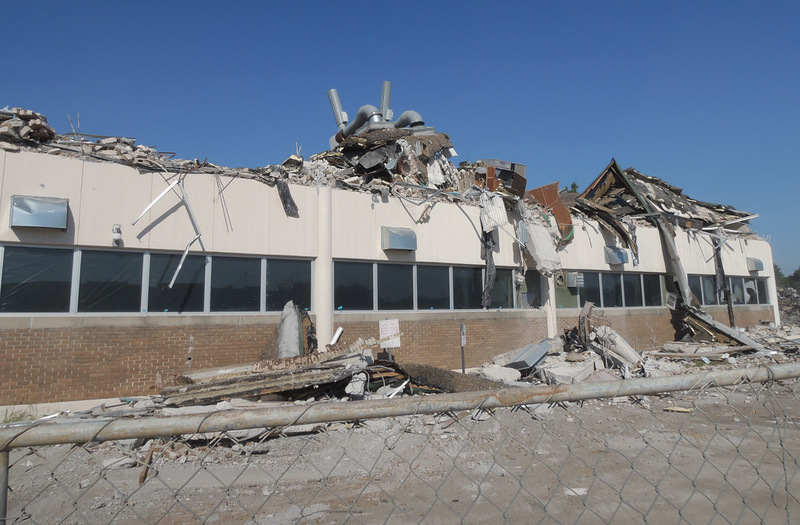 (30-April-2018) Looking east toward the west side of the building. 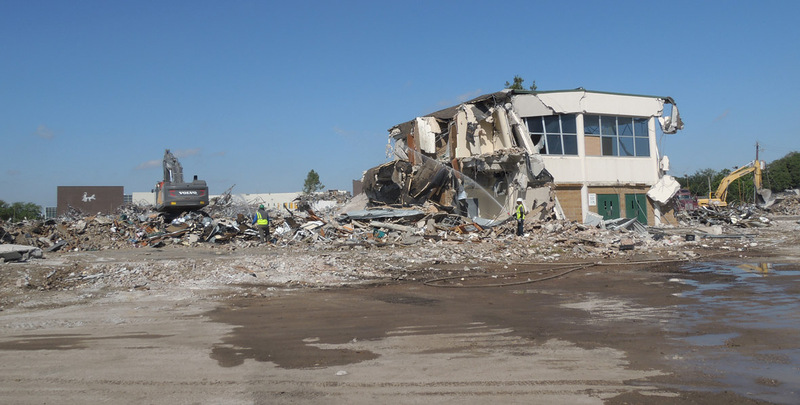 (1-May-2018) This was the view of the demolition from the new building, which is just west of the original building. 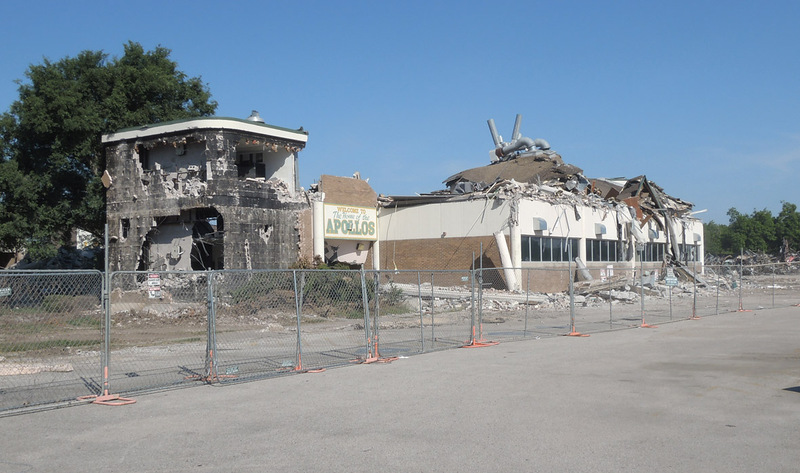 (2-May-2018) On May 2 the west side was mostly demolished, awaiting debris removal. (2-May-2018) The building was torn down using an excavator. 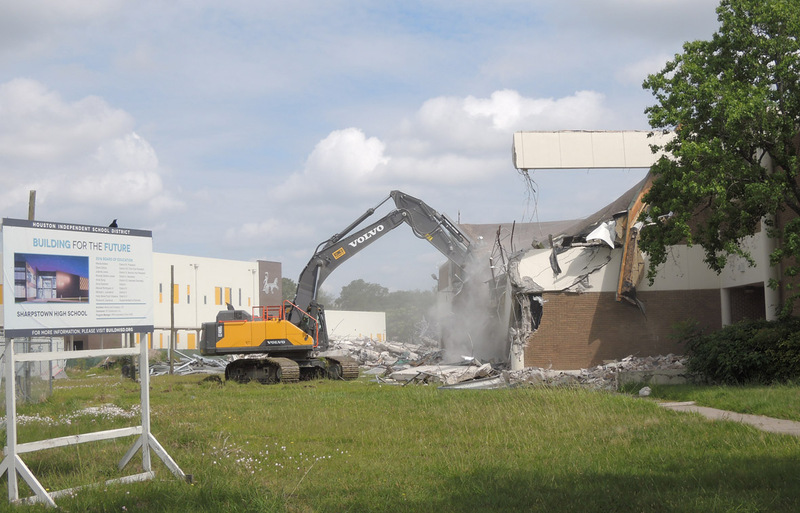 In this view, the excavator is busy on the left side of the main entrance. 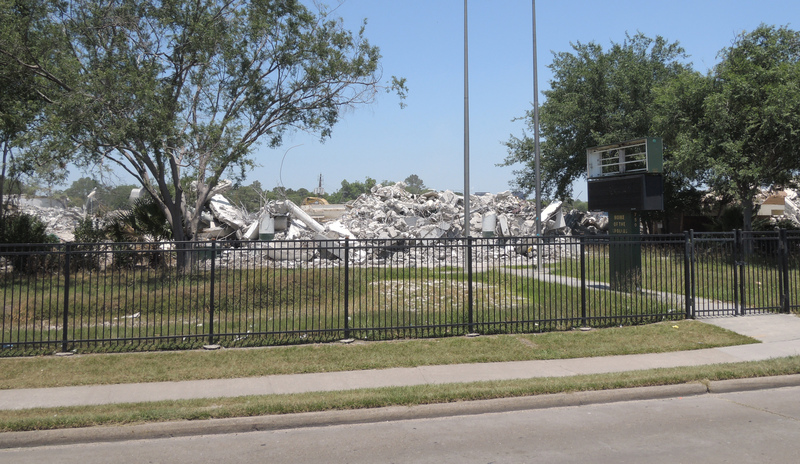 High Resolution (3-May-2018) On May 3, the west side of main entrance was demolished. High Resolution (8-May-2018) On May 8 only a partial section on the east side remained. (8-May-2018) The welcome message would remain standing for one more day. 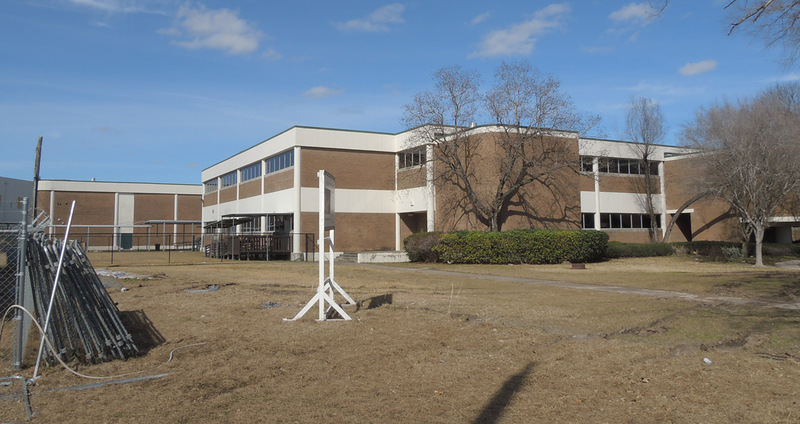 (8-May-2018) These classrooms were the chemistry labs. 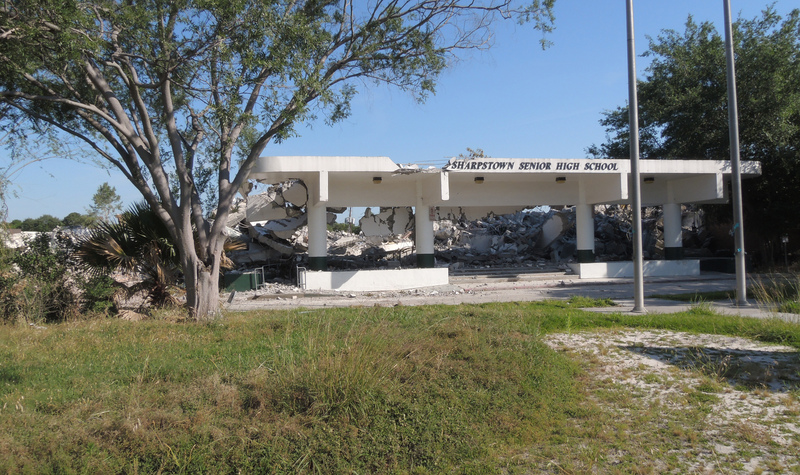 My homeroom was on this side of the building in this room for most of my time at SHS. High Resolution (8-May-2018) Looking west at the east side of the building. 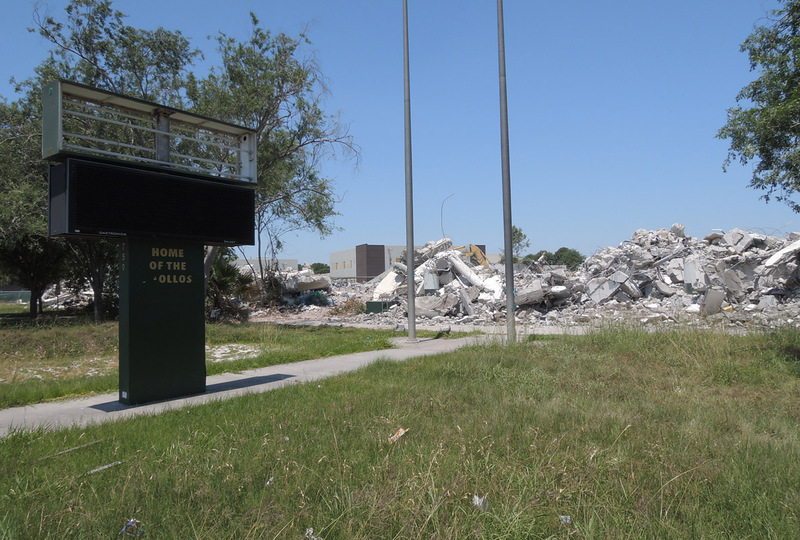 High Resolution (8-May-2018) The front entrance port-cochere remained standing, for the moment. (8-May-2018) This was the last day the sign remained intact. 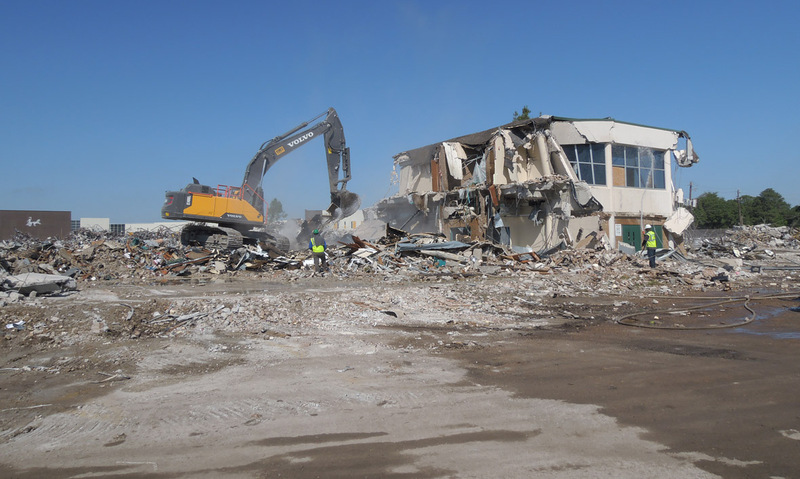 (9-May-2018) On May 9 the final demolition of the main structure took place. 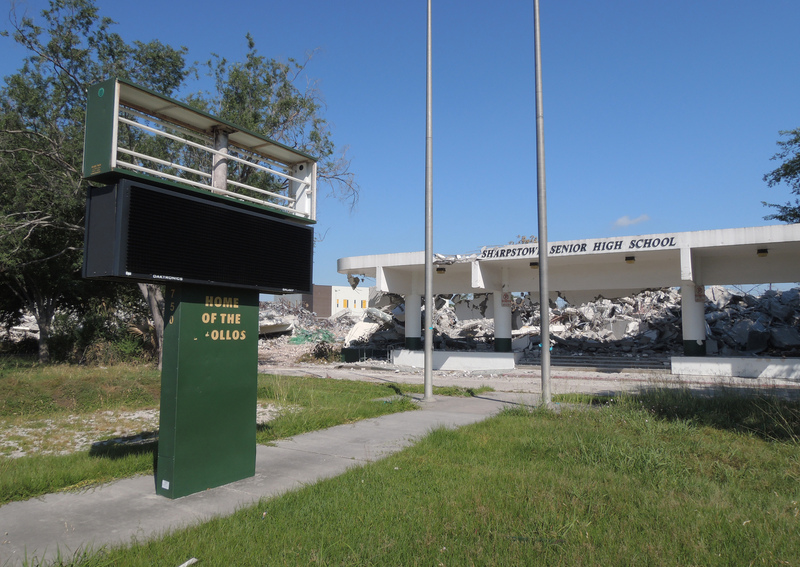 High Resolution (9-May-2018) The school name was removed from the sign in front of the original building. 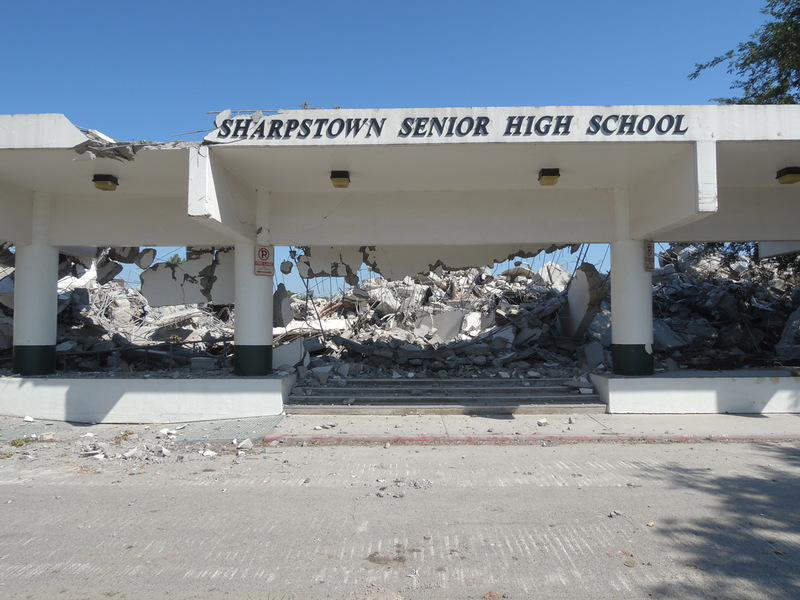 High Resolution (11-May-2018) On May 11, the building was demolished and debris cleanup remained. 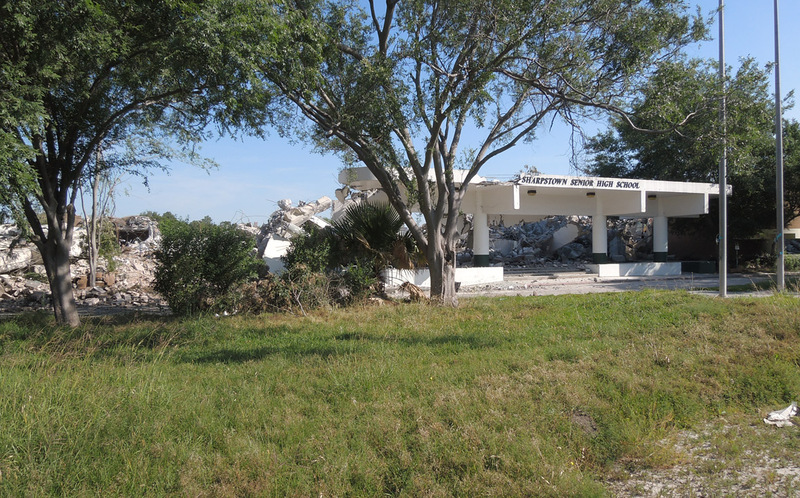 High Resolution (17-May-2018) By May 17 the front entrance port-cochere was reduced to rubble. 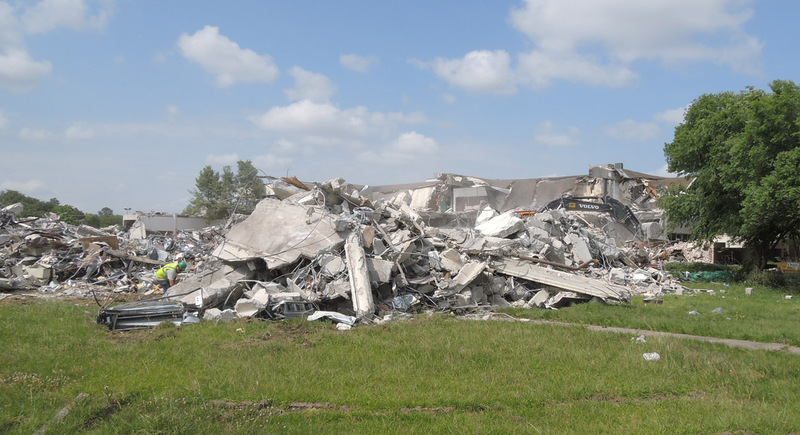 High Resolution (17-May-2018) Looking southwest across the school site from the northeast side, with only debris remaining. 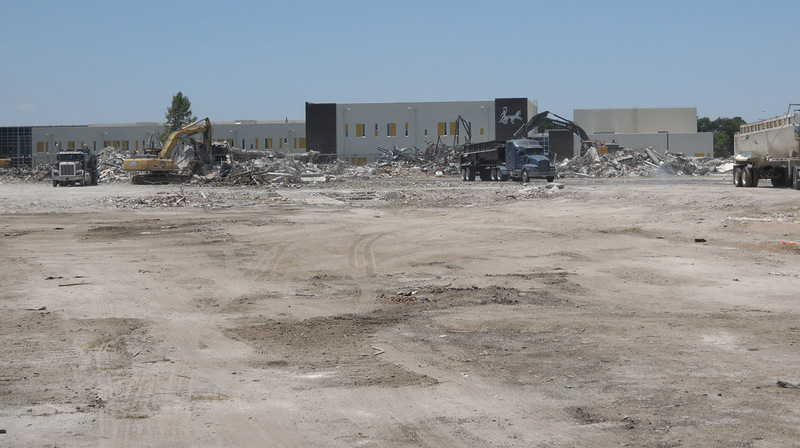 High Resolution (17-May-2018) Looking west across the site, with debris cleanup in progress. 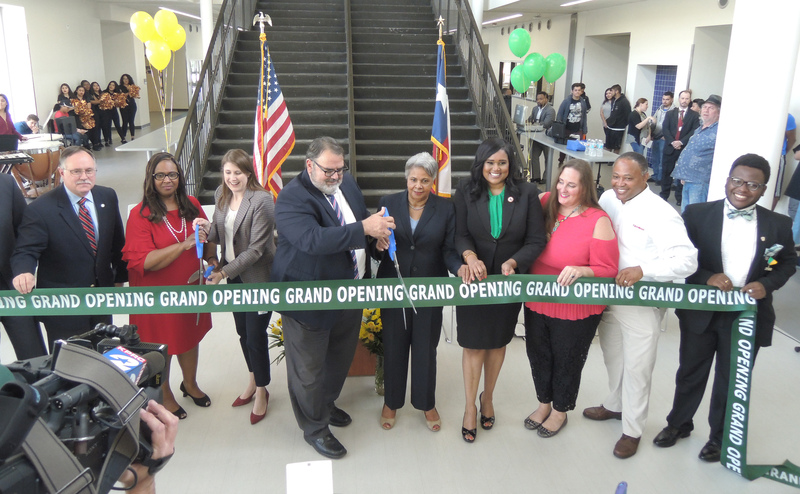 High Resolution On May 3 an official dedication ceremony took place in the new building. 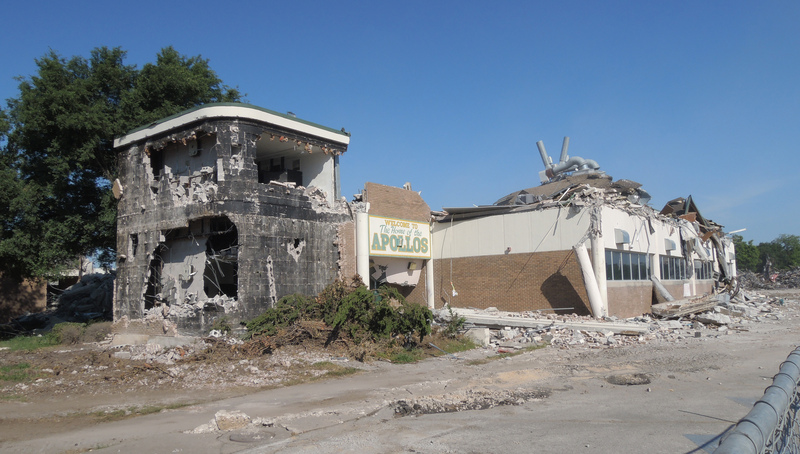 The building had been occupied since around January. 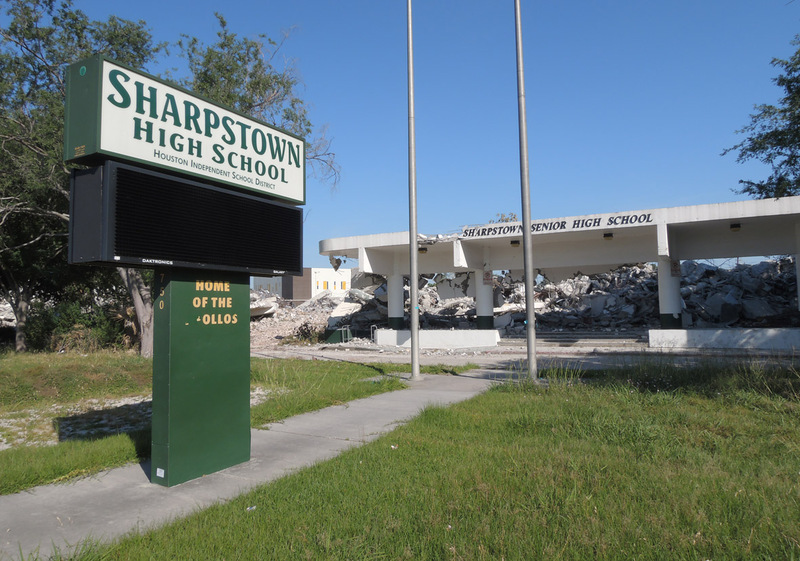 There were very few former graduates in attendance (maybe around 10) and it appeared there were no past teachers. 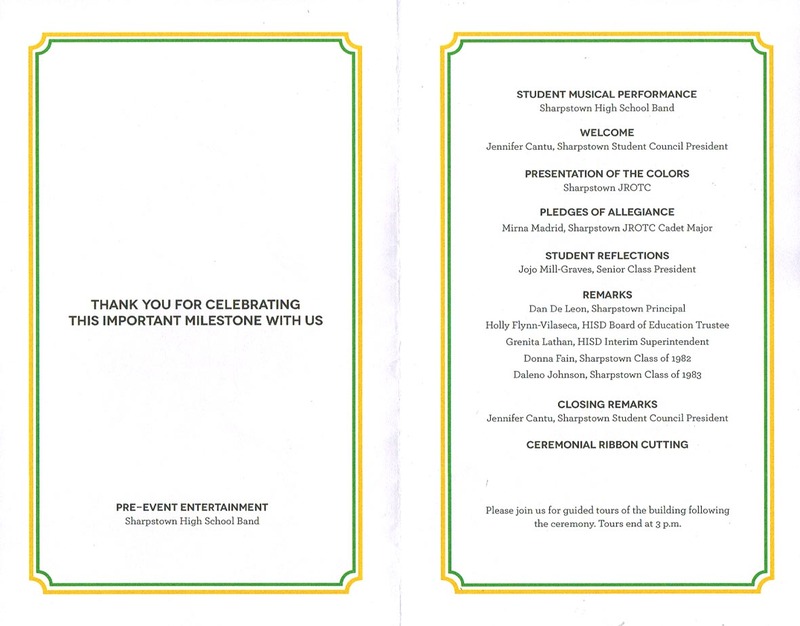 Two graduates from the classes of 1982 and 1983 spoke (see program below). 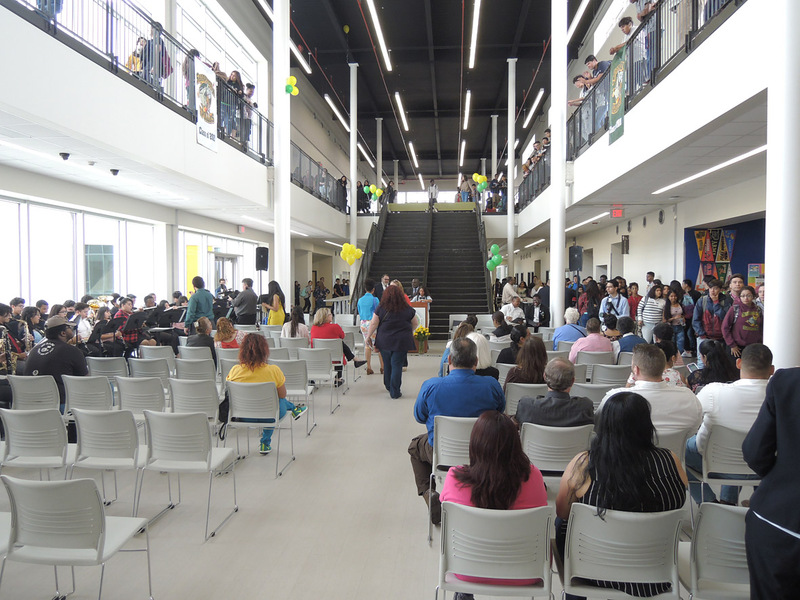 This is a view of the main hallway in the school where the ceremony occurred.